AFTERBUZZ TV -- The Following edition, is a weekly "after show" for fans of FOX's The Following. In this very special episode, hosts Joe Sanfelippo, Nando Velasquez, and Joe Braswell interview special guest Steve Monroe (Jordy Raines). 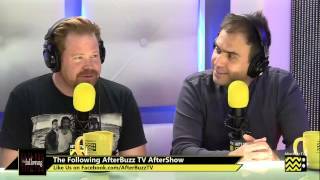 AfterBuzz TV's The Following's aftershow "Interview with Steve Monroe -- March 20th, 2013″!